The protein encoded by this intronless gene JUND is a member of the JUN family, and a functional component of the AP1 transcription factor complex. This protein has been proposed to protect cells from p53-dependent senescence and apoptosis. Alternative translation initiation site usage results in the production of different isoforms. 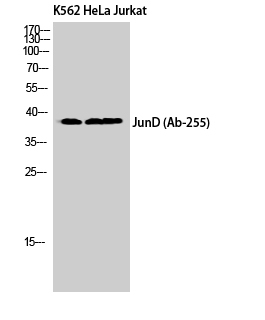 Phospho-Jun D (S255) Polyclonal Antibody detects endogenous levels of Jun D protein only when phosphorylated at S255.